For any internet wine site to be profiled in a major national news mag is, I think, truly significant. It shows that the news is out about how the web is changing the face of wine in this country--internet wine retail, internet wine blogs, wine podcasts, and wine TV. These forms of wine information exchange are revolutionizing how we buy, drink, and think about wine. The fact that you are reading this is evidence of this transformation. But for all of the tens of thousands of visitors that have stopped by here in the past 6 months, my traffic is miniscule in comparison to WLTV. The enormous number of people who flock to WLTV every single day go to see Gary drink wine, tell you what he tastes (and what he doesn't) and give highly opinionated commentary throughout the process. And that's the important bit, folks: Gary is not into objectivity. He loves the Jets, he loves wine, and he loves telling you why. None of this namby-pamby standing at a distance from the glass and contemplating it. Does he like it? If so, believe me you know it. And boy, you know it when he is less than impressed, too. 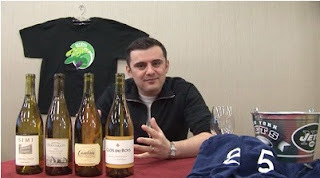 Stein contends that only on the web could Gary get away with analyzing wine this way. In five years, I bet there are a lot more places you'll be able to get away with it, given the phenomenal success of Gary's WLTV programming. Everybody who matches WLTV regularly has their favorite episodes, proving that Gary's wine-drinking viewing base is just as opinionated as he is. I don't know whether mine is the episode where Gary scours the supermarket to find things to taste to help you develop your wine palate and vocab, or the decanting episode. The Wine Is Fun...Period show is also classic. Regardless of your favorite episode (and if you don't have one yet what ARE you waiting for? click on one of these links and let the addiction begin), the important thing here is that Gary makes it ok to be passionately opinionated about wine. And judging by the numbers of his loyal fans, this is a message that folks find appealing and inspiring. You know how I feel about wine and objectivity--it's all smoke and mirrors. Congratulations, Gary, for blowing away the smoke and showing us that everybody gets to have an opinion about wine. And here's to generations of wine drinkers to come who, thanks to Wine Library TV, will not be elitist, snobby oenophiles but relaxed, open-minded, wine enthusiasts. (After meeting Gary, Joel Stein is even going to try to get his mom to try something other than Yellow Tail). This month, Catavino's Virtual Tasting focused on a region rather than a varietal and after some searching I managed to find a wine that fit their brief to try something from the Bierzo DO. For someone like me who likes wine adventures, this was a great assignment. First, I didn't know where Bierzo was. Second, once I found it the list of indigenous grapes planted there took my breath away, since I had only had one or two. Bierzo is in the northwesterly part of Spain (Ryan and Gabriella have posted a great map, if you're still unsure of precise locale), and is home to 48 wineries. It used to be an area known for its mining industry, but with the mountains protecting the viticultural areas from some of the most severe weather coming off the Atlantic Ocean, Bierzo has become a growing and increasingly popular wine region. 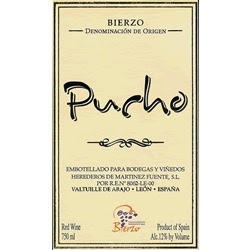 I wanted to try a Bierzo white, but had a hard time finding one, so I ended up with a red made from the indigenous mencia grape: the 2004 Pucho Bierzo ($15.99, Whole Foods; between $9 and $14 from many merchants). I bought this on impulse, with no advice or advance research, and in retrospect I have not been happy with a single Whole Foods purchase I've bought in this fashion. This was no exception. It was a red wine with old school style, with a rich plummy color and the fruit taking a decidedly back seat to the acidity and minerality. As the wine warmed up, it was possible to taste plummy fruit, accented with smoke and spice. The finish was fairly short, and not even the smoke and spice lingered. Though I've never had a mencia wine before, I felt like it was in the same varietal ballpark as cabernet franc (with its acidity and minerality) and sangiovese (with its acidity and plummy fruit flavor). For the price I paid at Whole Foods, I would have to say this represented poor QPR, but had I spend $8.99 for it at K&L I probably would have said good QPR. Still, it was sad to have my first ever poor QPR Spanish wine--the country has had a perfect track record so far! I'm going to do some more research among the postings in Catavino's forum and see if I can find more examples of Bierzo wine. I'd certainly like to give mencia another shot, and would love to try a white from the area if I can get my hands on it. Until then, I'm off to rummage in the wine storage to find a Spanish wine for WBW #35. 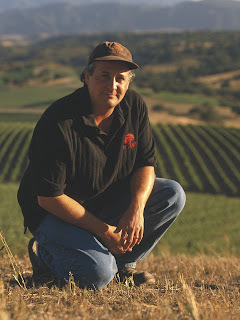 Grahm's goal is to make Bonny Doon a 100% biodynamic estate winery, a goal that I heartily approve of since I felt like the brand was getting a bit out of hand and losing its focus, and that its marketing strengths were in danger of outrunning his winemaking abilities. I'm happy to report as a DEWN (Doon Esoteric Wine Network) Club member, that I have received some of the smaller production Ca' del Solo wines and have really enjoyed the post-2003 bottlings. Going biodynamic has meant that Grahm cut back on production. He's also drawing on the skills of a talented team including director of viticulture Philippe Coderey, vineyard manager Nicole Walsh, and associate winemaker Jillian Johnson. 2004 Bonny Doon Vineyard Piemontese Blend Cá del Solo Vineyard ($20) had abundant initial aromas of cranberry and plum develop that developed herbal notes as the wine opened up. More cranberry was in the flavors, along with berry, plum, herb, and mineral notes. Mild tannins, and a dry, almost austere finish, this wine was made for pasta with red sauce or a simple grilled beefsteak. 2004 Bonny Doon Vineyard Dolcetto Cá del Solo Vineyard ($18) was very, very good. Dark purpley-red in color, its aromas were a tad alcoholic at first and there was a strong tannic grip to the first sips. Once it was left open for an hour, the tannins and plummy fruit integrated, and aromas of rose petal emerged to accompany a distinctive spicy flavor note. It's nice smooth finish made this a good partner for spaghetti carbonara. These tasting notes bode well for the future of Bonny Doon. Though neither of these particular wines is available any longer, there are several wines from the Ca' del Solo vineyard that are available over at their website, including an albarino, a muscat, and a grenache. (sorry there are no direct links, but the site if flashified, so you're on your own!) Also, it is worth noting that even wines that are designated DEWN, and are therefore restricted to club members for a time, often become available to everybody a little later on. This was the case with their grenache, for instance. But buyer beware. 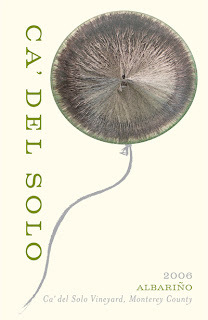 Not all Doon wines are biodynamic--only those from Ca' del Solo grapes harvested after 2003. And the first certified biodynamic grapes will be picked this fall. Additional caveats: last summer Grahm sold off the Big House and Cardinal Zin brands, so those aren't even made by Bonny Doon anymore. The Pacific Rim wines are in the process of relocating to parts north, although Grahm seems (for the moment at least) to still be involved in the project. 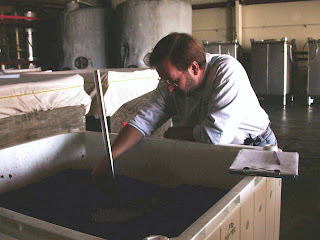 I'm enjoying being on Bonny Doon's journey from mega-brand to biodynamic estate winery. If you want to join me, head over to the website and pick up a few bottles. See what you think. If you think there is something inherently freaky about blending red and white grape varietals, you may want to think again. They've been doing just that for a long time in such chi-chi appellations as the Cote-Rotie in the Rhone. 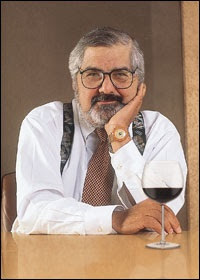 There, red wines can include up to 20% of a white varietal, viognier. The white grape lends its wonderful aromatics to the red, giving it a soft and somewhat mysterious aroma and a smoothness on the palate that can be extremely appealing. In the Cote-Rotie, the red and white varietals are grown together in what is known as a "field blend," then picked and co-fermented at the same time. Cote-Rotie reds are so perfumed and so popular that the technique was bound to spread, and today winemakers from Australia to California are blending white and red grapes. Sometimes they co-ferment; sometimes they simply white and reds that have been fermented separately. Recently, I had a co-fermented blend of syrah and viognier from the Languedoc-Roussillon region of France: the 2003 Le Freak Shiraz-Viognier ($13.99, Whole Foods; available from other merchants for between $11 and $13). Here the blend contains 85% syrah and 15% viognier. This blend was not as aromatic as most I've tried previously, and what aromas there were represented an odd combination of artificial flower and tar aromas. These were never very strong, and underneath there were flavors of blackberry, leather, and spice. This made for a chewy, rich syrah that (had I tasted it blind) I would never have pegged as a syrah-viognier blend. As a result, I reluctantly had to conclude it represented poor QPR, even though it was perfectly drinkable as a syrah. So does this mean I'm taking down my freak flag and giving up on red/white blends? Not on your life. One of my favorite wines of all time is the Black Chook, an Australian blend of shiraz and viognier that I simply adore. And I have a bottle of D'Arenberg's Laughing Magpie, another Aussie shiraz-viognier blend. Rumor has it that one of my favorite domestic wineries will be producing a small bottle run of just such a blend later this year, too. 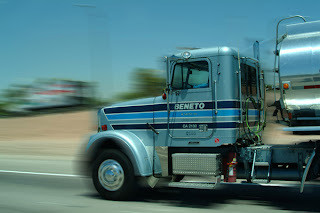 I'll tell you right now, I'll run you over if you get in my way to score some of that! Maybe this wine was past its prime, since Andrew at Spittoon in the UK was drinking the 2006 vintage just this spring. At any rate, my freak flag is still flying, and I'll still be on the lookout for good syrah-shiraz/viognier blends. Have you ever received a shipment of wine that you've been dying to try only to discover that it tastes funny? Not corked funny, like wet cardboard. Not cooked funny, like there is very little flavor or aroma. Just funny: muted, out of whack, disjointed? How long did you wait to open it? Until you'd pulled the tape off the packing box with your teeth? 2 hours? 2 days? If you answered any of the above, you probably didn't wait long enough. "The reality of bottle shock is that the wine, like a pendulum, will swing back and forth, in and out of consciousness, showing one week flabby and soft, and the next singing with bright acidity and no fruit. As well, they will appear muted, disjointed and likely to throw the flavors of one component wine over another. Also like a pendulum, however, these wines will stop swinging, settle down and become not only more consistent, but with fully formed bottle bouquet and considerable mid-palate definition and complexity." Usually, if a producer or merchant warns me of bottle shock issues, I wait to drink the wine for 2-6 months. As for travel shock, there are importers, wine shippers, and drinkers who all report that their wine tastes flat after shipping, but that a few weeks sets the bottle to rights again. Is it the shaking? The temperature fluctuations? The agitation? Who knows. But I do think that it is kinder to your wine to let it sit for a while after it has been tossed around in a UPS truck. Usually, I wait 2-6 weeks to open the bottles I've received in the mail. So if you wonder why there is such a long lag time between me happily reporting that I just got a shipment of wine and actually tasting the darn stuff, or wonder why I'm not guzzling my Cameron Hughes stash, it's because my wine is in shock--or at least I think it is. How about you? Do you believe in bottle shock? Travel shock? Any anecdotal reports to share? Cat (pee). Grass. Gooseberries. These are the flavors and aromas that are sometimes associated with assertive sauvignon blancs from the Marlborough region of New Zealand. If you're thinking "I'll pass, thank you," you may want to think again. Marlborough sauvignon blancs are very good summer wines, and about as refreshing as white wine can get with the exception of vinho verde. Cat pee aside (which I don't usually smell, to be honest), the herbal and grassy qualities of a Marlborough sauvignon blanc give the wines a summery feel, and the slightly sour, tart gooseberry flavor has the briskness to cut through the most humid day. Never had a gooseberry? If you've had an under-ripe Thompson green seedless grape it's not too far off gooseberry, and the truly desperate can look for some Follain's Irish Jam which comes in a fairly tart gooseberry variety. It is still a jam, though, so it is sweeter than any sauvignon blanc you're likely to try. Perhaps it would be easier to just look for the 2006 Villa Maria Sauvignon Blanc Private Bin ($10.95, Chronicle Wine Cellar; widely available from other merchants for between $9.99 and $14.99)? This yummy, refreshing, and excellent QPR Marlborough sauvignon blanc exudes grassy, grapefruity, and gooseberry aromas. A pale straw in color, the flavors are also full of gooseberry, with notes of the tart white pith from a grapefruit, a bit of cilantro, and a distinctive mineral streak that really adds freshness and complexity. This is not a tropical fruit salad style sauvignon blanc, but will make you think of cool green ferns, cool green vegetables, and juicy fruit. On a hot, sticky day this wine is perfect paired with a bowlful of peel-and-eat shrimp (I buy mine cooked at the store or frozen in the bag at Trader Joe's), crack open a jar of cocktail sauce, and toss a salad. Serve with some chunks of a good baguette, and the summer heat won't bother you nearly as much--especially since everything's so cold, crisp, and refreshing and you've barely spent any time at all in the kitchen. Villa Maria is a family-owned New Zealand estate winery, and they were one of the first wineries to go 100% screwcap in 2004. Their Private Bin line of wines was developed to display the true varietal characteristics of the grapes in question. While their sauvignon blanc is the most widely available of their wines in the US, keep your eyes out for their other bottlings (including pinot noir and gewurztraminer) since this is a producer that consistently produces high quality, good value "go-to" wines. It all began years ago on Father's Day. Since 2002, wine-making has been a family affair at Anglim, with all hands pitching in to craft distinctive, vineyard- designate wines and blends made with the best fruit that they can source from their viticultural partners in Paso Robles and Santa Barbara County. 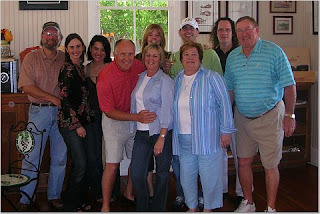 (picture of the Anglim Crew courtesy of Anglim Winery). Today, they produce around 3000 cases a year and specialize in Rhone varietals. In their wines, the Anglims try to achieve the perfect balance between the varietal essences of the fruit, the added character provided by the barrel, acidity, and freshness--and they succeed. They've opened up a tasting room in the old Paso Robles train depot, so if you're planning a trip out there you should definitely make a stop and check out their wines. Here are my impressions of the Anglim wines I tasted at the 2007 Rhone Rangers Tasting. Prices indicated are the suggested retail prices at the winery; as always the price you pay may be higher or lower. Clicking on a wine's name takes you either to a list of merchants who stock the wine, including Anglim itself which maintains an online store which you can reach directly by clicking here. If you become a fan of Anglim wines you may want to consider joining their Winemaker's Club, which will ensure that you get quarterly shipments of 3 or 6 bottles as you prefer. Their wines are popular, and they do sell out of them, so joining the club is your best defense against seeing the dreadful word "unavailable." 2006 Anglim Rosé ($15) I just loved this excellent QPR, salmon-colored wine. Made from grenache, syrah, mourvedre, and viognier grown in Paso Robles, it is full of rich floral aromas from the viognier. Then the wine turns rich and complex with raspberry and strawberry flavors that have a real depth thanks to that mourvedre. An outstanding example of a US dry rose, this is the rose I'd buy a case of and have on hand for all your summer BBQ and picnic needs. Save one for Thanksgiving, too, since this is sure to appear on my list of wines that would go great with turkey. (PS: I'm not the only one who thinks this wine is great. Check out Ken's Wine Guide for a comparably enthusiastic review.) Excellent QPR. 2005 Anglim Roussanne ($22). Another beautiful wine from Paso Robles fruit, here fresh orchard pears and apples dominate the flavors and aromas. This wine tastes like spring, and is less heavy than most wines made with this varietal. An excellent food wine. Excellent QPR. 2003 Anglim Syrah Fralich Vineyard ($20) This chewy, beefy syrah had interesting grilled herb aromas and flavors that accented the blackberry and raspberry fruits. A very nice value, and excellent QPR. 2004 Anglim Viognier Fralich Vineyard ($22) Nice, fresh honeydew aromas accented with floral notes are the lead in to this wine that has loads of fresh-picked, juicy honeydew flavors. Great for summertime. Very good QPR. 2005 Anglim Viognier Bien Nacido Vineyard ($24). Winner of a silver medal at the San Francisco Chronicle Wine Competition, the Santa Barbara fruit used in this Viognier give it a riper, rounder flavor profile than the Fralich Vineyard bottling. Appealing honeydew aromas and flavors predominate, accented with flowers. Very good QPR. 2004 Anglim Grenache ($24) I really liked the abundant blackberry, coffee and spice aromas and flavors of this wine. Aromatic on the front end, rich on the back, this is very appealing and more complex than many wines made with this varietal. Very good QPR. 2003 Anglim Syrah Best Barrel Blend ($40). This wine is still too young to judge it fairly, with its balance between acidity and fruit not fully developed, but there are already lovely chocolate notes underneath rich red fruit and spice. Give it time, and it should be excellent, and make for a good special occasion wine for a grand dinner, or for a candlelit meal for two syrah lovers. Good QPR. If you got a wine-making kit for Father's Day, you may want to clear out the garage and start looking for some viticulture and enology courses now. Steve Anglim was bitten by the wine-making bug. You could be, too. Or, you could just do what I do and buy Anglim wines whenever and wherever you see them! Right on the heels of yesterday's Spanish wine review comes the announcement of next month's Spanish-themed WBW. Michelle and Kevin over at My Wine Education will be our hosts for the July edition (#35!) of Wine Blogging Wednesday, the online tasting event started by Lenn Thompson of Lenndevours. They have a great theme: Spanish value wines. Drink red, drink white, drink rose, drink whatever you want and try to stay around $10 (they'd like us to try for something under $10, but promise not to penalize folks for straying slightly above). As regular readers know, one of my wine resolutions for the year was to try to learn more about Spanish wines, and wines under $10 are right up my alley, so I am looking forward to this theme. Here at GWU$20, I've tasted a number of wines that fit My Wine Education's brief, including some albarinos, a memorable rose, and tempranillo, and I've enjoyed each and every one of them. To participate, drink something Spanish by Wednesday, July 11 and email your reactions (and your URL if you are a blogger) to spanish.wbw@gmail.com. The folks at My Wine Education are especially eager to know what the selection of Spanish wines was like in your store, and whether you felt the wine you tried was good value. No blog? Just email Michelle and Kevin your thoughts, and they will post them in the roundup. If you are living in the US, and are just getting started on Spanish wines like me, these are most likely the wines that you are drinking. In general, I have tended to like the white varietals (Albarino and Verdejo) more than the reds, which may just be a result of not drinking enough of those wines, or drinking not very good examples. 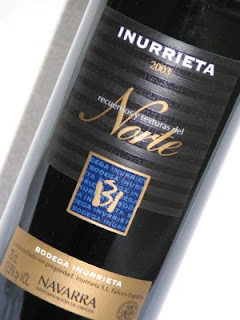 But the other day I had a fantastic wine that made me think there was a world of Spanish reds that I'm not yet finding easily in the stores: the 2003 Bodega Inurrieta Norte ($12.99, Rosso Wine Shop). And it wasn't made from tempranillo, but from a blend of cabernet sauvignon and merlot. This was a rich, smoky wine, with a deep inky crimson color and inviting aromas of spices, flowers, and rich red and black berries. Bodega Inurrieta makes their wine in the Navarra region, which has both warm Mediterranean and cooler Atlantic influences. These different influences help the grapes to develop their full potential without over-ripeness. The flavors of cassis, clove, and cedar were equally rich and inviting and lingered in your mouth, making it a pleasure to drink glass after beautiful glass. And you could do just that because the wine had 13.5% alc/vol despite its rich and flavorful profile. What most impressed me, however, was the wine's superb balance, since the acidity that gave the wine structure was perfectly paired with the fruit and the oak. Excellent QPR. I drank this wine at a terrific restaurant in London that specializes in tapas and small plates called The Salt Yard. If you are in the UK for whatever reason, try out this restaurant located in Bloomsbury near the British Museum and the University. Great food, great service, and a great location combined to make it a very nice place to spend an evening with friends. I couldn't decide between 2 Spanish wines and our server let me taste each (this is fantastic, and I wish more places offered this service). Both were great, but we picked the Inurrieta which arrived at our table at the perfect cool cellar temperature (just lovely on a warm summer night when you plan on eating a fair amount of chorizo!). It cost around 18 BPS (roughly $35) which is amazing considering wine markups, how good this wine was, and the unbelievably weak dollar. I found only one wine merchant in the US who carries this wine, and happily they're right around the corner in beautiful Glendale: the Rosso Wine Shop. I've not been there, but they will be at the top of my shopping list later this summer since they specialize in everyday wines from Italy, Spain (check out their list of Spanish offerings here), France, and California. And at $12.99 a bottle, this Bodega Inurrieta "Norte" certainly qualifies as an everyday wine bargain. If you've found a great Spanish red--whether a tempranillo or some other varietal--let us know in the comments below because I'd certainly like to try a wider range. A big thank you to Catie of Through the Walla Walla Grape Vine, our fearless host for WBW #34, who has posted the roundup for this month's virtual tasting event which focused on Cabernets from Washington State. 32 bloggers reviewed 45 wines (including a riesling!) which gives you lots of good wines to look for in your local shops if you are a cabernet fan. Still no news on WBW #35, but when there is I'll be sure to let you know! This card-carrying member of the Daughters of the American Revolution and former Foreign Service Officer took on the big guns of interstate shipping and made the quiet, convincing argument that the wine that she and her husband, Wayne, made at their historic Virginia farm was no different from any other agricultural product. She could sell her hay in another state, why not her wine? Wasn't it un-Constitutional to restrict her access to free trade? 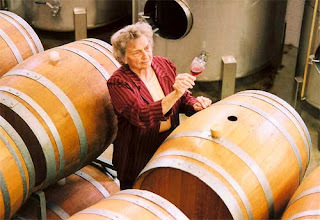 The Supreme Court agreed with her and her fellow petitioners, and handed down a decision on May 16, 2005 that a state could not set up different restrictions for wineries that were in-state, and those that were out-of-state. It was the first major blow against direct shipping restrictions, and one that continues to be fought by Free the Grapes and other organizations and winery coalitions. Sadly, her business- and life-partner Wayne had died one year earlier, and did not survive to see their victory. The Swedenburg family has established an fund at the Virginia Wine Growers Association to promote education and the Virginia wine industry. If you'd like to make a contribution in Juanita's honor, send it to the Juanita Swedenburg Memorial Education Fund, c/o VWGA, P.O. Box 10045, Alexandria, VA 22310. Summertime. Even if living isn't easy, it sometimes seems easier with the long summer twilights, cooking outside, and lots of entertaining. Even finding summer wines can be easy, as long as you remember that they, too, should reflect the season. But sometimes a "simple summer sipper" is not what you're looking for. You want a wine that fits summer's easy-going mood, but has a little more brains than a quaffer. That's when I reach for a white wine from the Vouvray appellation of France's Loire Valley. Vouvray wines are produced from 100% chenin blanc grapes, the marvelously versatile white varietal that can make dazzling dry, off-dry, and sweet wines in both sparkling and still varieties. The varietal seems especially able to soak up the influence of the soils and earth in which it was grown. In the Loire, most of these soils are full of limestone and minerals, which imparts a nice, stony edge to the grapes that are grown there. This stony, mineral-inflected profile of a good Vouvray is what makes for a refreshing summer white with brains. 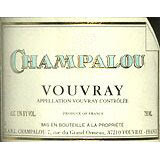 I recently had a dry vouvray that had excellent QPR and was a terrific summer white: the 2005 Champalou Vouvray ($14.99, Mission Wines; available from many merchants for between $10 and $17). I've had this wine twice, and it impressed me each time with its aromas of lemon blossom and minerals and its summery straw color. It is intensely aromatic, but even more flavorful, with pure lemon essence, herbal, and stone notes. I found this wine was perfectly situated on the cusp between dry and off-dry, so it would be perfect for Indian food or other highly flavorful or spicy food. Try it with some tandoori shrimp skewers done up on the grill with a mint and cilantro pesto dipping sauce for a perfectly easy, and perfectly delicious, summer meal. Catherine and Didier Champalou's wine-making efforts are profiled over at the Wine Doctor if you would like to find out more about them. They make some excellent value Vouvrays, and are a producer to keep your eye out for if you are looking for a reliably good producer. Blog fatigue. It hits most bloggers, even the wine bloggers. That sense of dread as you contemplate your wine racks and think, "oh no, I have to drink a bottle of wine and then write about it." Sometimes this is accompanied by a sinking feeling when you realize that you want sauvignon blanc because it's hot and sticky, but you've reviewed six in a row. You really SHOULD drink something else, or your readers might get bored and pole off to some new blog. Personally, I think this summer trend of blog breaks is great news, even though I miss getting updates from my favorite writers. 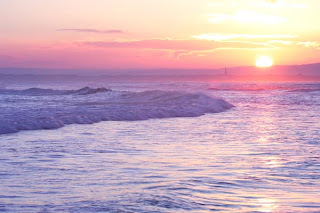 But even bloggers need vacations, and we should all be getting more down time in this stressful world. So if you don't find a new blog post every day from your favorite bloggers, don't lose faith in them. They just need a rest. And wouldn't you rather they took a few days off than stop blogging entirely? I know I would. So here's a toast to Jeff at Good Grape, John G at Quaffability, and all the other bloggers who are taking some time for themselves. We can't wait until your back. Welcome to Wine Blogging Wednesday #34, the online virtual tasting event dreamed up by Lenn Thompson of Lenndevours and hosted this month by Catie over at Through the Walla Walla Grape Vine. Catie picked a great theme for this month's event: Washington State Cabernet Sauvignon. I've had a few cabs from this region, and have always liked them, but this was my first opportunity to try to explain why. And though Catie encouraged us to look beyond Columbia Crest and Chateau Ste. Michelle, I had a hard time locating a cab by anyone else in my neck of the woods. I checked four stores, but then threw my hands up in defeat and opened something in the closet. What I opened was the 2003 Chateau Ste. Michelle Cabernet Sauvignon Indian Wells ($13.99, Costco). Indian Wells is an area in central Washington that extends from the Wahluke Slope to Cold Creek along the Columbia River. It was a dark, inky purple-red in color. Warm aromas of spice, currant, and tobacco leaf were interesting and inviting--especially for a cabernet at this price point. Flavors of red currant, blackberry, herbs, and more warm spices followed through on the promising aromas. The well-integrated tannins made for a plush drinking experience, which was round and fruit-forward without becoming a characterless fruit bomb. This wine had excellent QPR for a cabernet sauvignon, and I would definitely buy it again if I saw it. What impressed me most about this wine was its balance. Though fruity and rich it was not heavy, oaky, or demanding like some California Cabs can be. It was easy to pair with food, especially food with an earthy or smoky edge like smoked apple chicken sausage and some mashed potatoes. Most cabernets seem to demand beef for me, but this wine didn't. It would be good with a steak, don't get me wrong, but think of things that are grilled or smoked as well. They'd be great with this wine. Thanks to Catie for such a great theme--and I'm sorry I couldn't find a more exotic bottling. I will try to seek out more Washington cabs based on this experience. As always, I'll have a link to the roundup of all tasting notes when its completed, and an announcement about WBW #35 as soon as it is posted. Do you read your daily horoscope in the paper or on Google? If so, do you know what your astrological sign might say about your taste in wine? 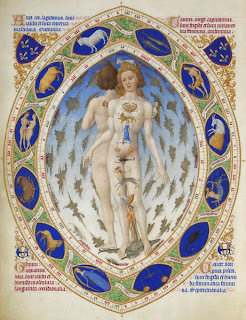 I was surprised to discover that there are a lot of places on the web that try to link wine to the 12 signs of the zodiac. Here are a few for you to check out in order to beat back the Tuesday doldrums. Australian wine writer and educator Martin Field has put together a slightly-tongue-in cheek guide to how your astrological sign influences your wine habits. Mine says I have a low boredom threshold--which is true. It also says I have to watch out in case I start binge drinking. I don't worry too much about this, because I can't drink more than two glasses of wine a night without falling asleep in my dinner! Not into western astrology, but prefer something with an Asian influence? A similar article by Ed Soon links your Chinese Zodiac sign to wine. According to Chinese astrology, I'm a Snake, and that means I should like Chardonnay (oops...sometimes the stars get it wrong) and Beaujolais (right on!). 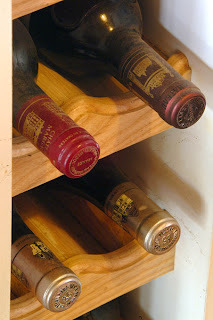 Thanks to the Celebrate Wine blog for drawing my attention to this post. Of course, where the stars go, money is sure to follow. Wine.com has found a way to link astrology to their wine search engine, to help you find the perfect bottle for you, or for someone you love. For an Aries like me they recommend syrah or shiraz (which I love). They haven't profiled all the signs yet, but they have covered Taurus, Gemini, and Cancer. If you're not on the list yet, I'm sure they'll get to your sign soon. Now that the weather is turning warmer, it's time to bring out the summer whites, and what could be more summery than a white wine named after a cooling breeze? I bought the 2005 Bodegas Naia Las Brisas ($9.99, Beverages and More) on the recommendation of Sonadora at Wannabe Wino, who gave me some help back in January when I posted my New Year's Resolution to learn more about Spanish wines. I had a hard time finding it--it was always out of stock at my local BevMo--but finally I got my hands on some. 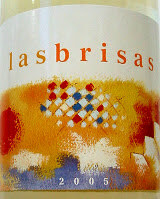 The 2005 Bodegas Naia Las Brisas was very pale straw in color, to the point of being almost translucent. Made of 50% Verdejo (which is not the same as Verdelho, but an entirely different grape), mixed with equal parts of sauvignon blanc and viura, I liked the fresh aromas of apples, pears, and the pungent white pith of a lemon after you've zested it. All of these aroma notes can be found in the flavors of the wine, and that lemon pith note gives the finish a slightly bitter edge. One important point: if you serve it too cold there will be almost no flavor to this wine at all, just a citrus impression. Let it warm up a bit, and the orchard fruits characteristic of the varietal do come out, along with an almond flavor that is very appealing and different. I've never had a verdejo wine before, but its strong display of the grape's varietal characteristics combined with its low price makes me think this represents excellent QPR. The Las Brisas is a perfect appetizer wine, or just for sipping with a handful of almonds or nuts after work. But it also goes great with shellfish. We had it with a Southeast Asian Shrimp Salad, made with a simple dressing and loads of vegetables and herbs. It was a terrific pairing, since the clean, tart flavors in the wine and the salad matched each other. This wine was made in the Rueda wine region just north and west of Madrid, an up-and-coming area that is known for its white wines. Even if you can't get your hands on the Las Brisas, try a Rueda white this summer. Chances are it will be just as crisp and refreshing as this wine was. Good news for us: Steve wasn't nuts. Beckmen's hilly vineyard was planted on a limestone subsoil just like the Cote Rotie and Chateauneuf du Pape, with marine influences, and lots of sunshine. The steep terrain dictated how he could plant his grapes, with the result that you don't see row after row of orderly lines of vines but a patchwork quilt of plantings (for a great map, click here), each one of which had its own microclimate and soil conditions. It turns out that Purisima Mountain was indeed perfect for growing the Rhone varietals Beckmen wanted to plant, including syrah, roussanne, grenache, marsanne, and mourvedre. But Steve Beckmen didn't just want to grow Rhone varietals in a challenging spot. 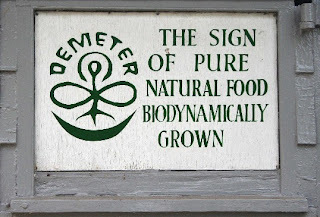 He wanted to respect the land, and to do that he decided to try out biodynamic farming protocols. Beckmen noted that the vines he grew biodynamically were strong and healthy, that the soil surrounding them retained its moisture, and that the grapes produced had a superb balance between natural sugar and tannin structure. 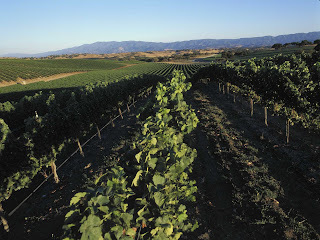 In 2006, the vineyard began a new stage in its development, with 100% of the vineyards on Purisima Mountain farmed biodynamically, and watered by drip irrigation to minimize water waste. Here are my notes on the Beckmen wines I tasted at the 2007 Rhone Rangers Tasting this spring. Prices indicated are the suggested retail prices at the winery; as always the price you pay may be higher or lower. Clicking on a wine's name takes you either to a list of merchants who stock the wine, or directly to the Beckmen online store. 2005 Beckmen Vineyards Cuvée le Bec ($18) A super Rhone-style red blend with lots of great structure from the tannins and acidity, and deep fruit flavors. Made from a blend of grenache, syrah, counoise, and mourvedre, it has a lush set of berry and chocolate aromas and flavors. Excellent QPR. 2005 Beckmen Vineyards Grenache Estate ($28) Possibly my favorite of the Beckmen wines tasted, in large part because of its lovely aromas of blackberry, dusty earth, and flowers. These notes appear in the flavors, too, and the wine just screams out "summer in Santa Ynez." Excellent QPR. 2005 Beckmen Vineyards Le Bec Blanc Purisima Mountain Vineyard ($20) If you love white Rhone blends as much as I do, make sure you try to find this engaging blend of roussanne, marsanne, and grenache blanc. It has a nice balance between round fruit and acidity, with lots of citrus and orchard fruit flavors and aromas. This wine is aged in oak, but the oak is neutral and doesn't impart an oaky flavor, just adds a creaminess of texture. Excellent QPR. 2006 Beckmen Vineyards Grenache Rosé Purisima Mountain Vineyard ($18). This is a crisp and light rose that is perfect for summer sipping. Watermelon in color, the wine has juicy watermelon aromas. Nice round fruit flavors of summer berries and melon build to a dry finish. Very good QPR. 2005 Beckmen Vineyards Syrah Estate ($25) Ripe red fruits, rich coffee, and dusty chocolate notes fill the aromas and flavors of this young red. There's still a pronounced grip of tannins to pucker the edges of your tongue, so I'd give it a few more months at least to settle down if you can possibly wait. Very good QPR. 2004 Beckmen Vineyards Syrah Purisima Mountain Vineyard ($40) The distinctive mineral components of the Purisima Mountain vineyards really come through on this big syrah. Berries, coffee, dark chocolate, and spice are evident, too, in both the aromas and the flavors. Even at the relatively high price, good QPR for what it undeniably a very special syrah that doesn't taste like any domestic syrah I've ever tasted before. If you like Rhone varietals, seek out wines produced biodynamically, or are drawn to wines that exude terroir, then you need to know more about Beckmen Vineyards. If you see them on the shelf of a wine store near you, don't hesitate to pick one up and give them a try. I think you'll be a fan. And if you're already a Beckmen fan, leave us a comment and tell us which are your favorites. I just got my 2006 Bordeaux report in the mail from K & L Wines, and the June 30 issue of Wine Spectator, which includes the 2006 Bordeaux barrel tastings report. This can only mean that the futures market is open, and sure enough, I headed to K &L and there they were, with their prices, and their reviews, and the alluring little "Add to Basket" button. But should you buy now? Good question. It's impossible to perfectly predict how any wine will age. Nevertheless, experienced tasters can give you some sense of where they think a wine is heading when they do their early tastings of the wines. And then there's cost to consider. The wines will sell now for $3-$10 a bottle less than they will after they arrive in the stores. And unless the wines fail to develop, they are selling now for at least $10-$20 a bottle less than they will sell for when they begin to hit their stride, around 2011. Before you buy, you should decide if the style of the 2006 vintage is for you, then you have to decide if you want to gamble on the wines now or wait until they develop further, and finally will you have room to store your Bordeaux properly once they arrive? I can't answer the second two questions for you, but I can tell you what the folks at K & L Wines are saying about the style of the 2006 vintage: there are good 2006s, many of which are classic in style (meaning that they are not huge and ripe). You may want to sit this vintage out if you like your Bordeaux lush. But if you admire restrained Bordeaux, with herbs and spice to balance out the fruit, this may be a good year for you IF you buy carefully. Here are some of the wines that stood out to me from their early reports, with links to the ones that are already on the site and ready for purchase. Of course, your local Bordeaux merchant or favorite internet supplier may already have price details for these wines, too. But I'm a loyal K & L customer, so that's where I'm sending you! One wine I'd take a look at is the 2006 Caronne Ste. Gemme from the Medoc ($12.99, K & L Wines) with dark fruit flavors and aromas and good balance, which often indicates that a wine will continue to develop and improve. At a higher price, the 2006 Cantemerle ($26.99, K& L Wines), also from the Medoc, is getting great reviews and advance reports, with many saying it is better than the 2005 vintage. In the middle price range, I'd seriously consider the 2006 d'Aiguilhe ($21.99, K& L Wines), a merlot-based Bordeaux which is drinking lush and round, according to the buyers. In Sauternes, head straight for the 2006 Doisy-Vedrines ($17.99/375 ml, K& L Wines), which is always a great value and looks to have come through the difficult vintage without problems and to be priced well. More futures are hitting the market every day, so expect the stock at K&L to change. They have lots of good 2005 values, too, if you haven't yet picked any up. If you buy 2006 Bordeaux futures, don't expect to see them until January-June 2009. And don't expect them to begin to drink well for 3-5 years after that. Of course, you can always check back here in 2013 and see what I think of the 2006 vintage! And if you're new to Bordeaux wines, you may want to check out my previous posts on "Beginning, Budget Steps into the World of Bordeaux," scrolling down to the bottom for the first post. Owen Roe O'Neill was an Irish hero who fought against Oliver Cromwell's English army in the 17th century. This heroic figure inspired Jerry Owen and David O'Reilly, the partners who bring us Owen Roe and O'Reilly wines. Owen Roe is based in the Willamette Valley of Oregon and they make stunning wines, especially red wines, under the Owen Roe, O'Reilly's, and Sharecropper's labels. The Abbot's Table red blend is their most popular bottling. Falling in the middle of the Owen Roe/O'Reilly's price spectrum, it combines a good price point with a lush, complex flavor profile. I tend to pick up a bottle on release and drink them a year later, and of course I love the woodcut label. Recently I opened up the 2004 Owen Roe Abbot's Table ($26.99, Mission Wines; available at many merchants for $20-$30) It was a very nice red blend of Cabernet Sauvignon (44%), Syrah, Merlot, Cabernet Franc, Zinfandel, Grenache, Malbec, Pinot Noir, and Counoise. It had a deep, rich, plummy color. When you opened the bottle, you were struck by aromas of cedar, plum, blackberry, and earth all of which developed as the wine opened up and softened. All of these notes were detectable in your first sips of the wine, with intriguing minty and herbal notes added in and a distinctly peppery finish. Even though I waited a year it was as till a tad bit disjointed, with the flavors not quite hanging together fully yet, but it was still plush and easy to drink as long as you gave it some air in a decanter or glass. But if you've still got a bottle, I'd wait another 6-9 months before opening it with some warm winter stew or a roast. Even though this was scrumptious, there are many red blends out there that drink well for less money, so I gave this good QPR. 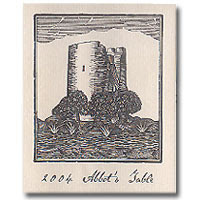 The 2005 Abbot's Table has also been released, and CellarTracker drinkers seem to like this vintage just as much as the last, so if you can't find the 2004, you might want to pick the later bottling up instead. I already have, and its going to sit just where it is for another year before I open it up and taste it. See you next year at the Abbot's Table. Do you like spicy wines? If so, you're probably thinking of zinfandel, with its cracked pepper notes, or syrah, with its clove and licorice flavors. But whites can be spicy, too, especially the perfumed white varietal gewurztraminer. Like riesling, gewurztraminer can be made in a variety of styles from off-dry to dry, depending on the climate in which it is grown and the maker who crafts it into a wine. These days, there are a lot of gewurztraminers out there that are so floral and fruity that their spiciness can take a back seat. Unlike most young rieslings, however, gewurztraminer is a relatively full-bodied white with a satiny, sometimes oily texture in your mouth like a roussanne or a marsanne. And it has loads of perfume, like viognier. So if you like the flavor profiles of riesling, the floral aromas of viognier, and the heavy mouthfeel of marsanne and roussanne, you will probably like gewurztraminer. 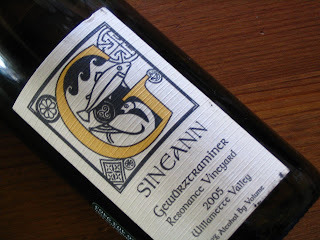 Recently I had the 2005 Sineann Resonance Vineyard Gewurztraminer ($19.99, Mission Wines; available from other merchants for under $20), and it was full of perfumed, spicy gewurztraminer character. Sineann wines are made by Peter Rosback, who purchases grapes from a variety of growers in Oregon, including Kevin and Carla Chambers who farm the Resonance Vineyard in the Yamhill-Carlton District AVA. The Chambers employ biodynamic viticultural practices to infuse the grapes with greater terroir, and to minimize the use of pesticides and other chemicals. Little gewurztraminer is grown in the US, which makes it hard to find a good domestic bottling for under $15, though over $15 you have more options. This gewurztraminer was made in the dry style, with appealing aromas of apple blossoms, peach, and litchi. Sipping this wine the flowers disappear, but the peach and litchi remain and along comes a warm spiciness. The spiciness carries over through the extended finish. I thought this was an outstanding example of the varietal, and excellent QPR. I like to pair a spicy gewurztraminer like this with something equally flavorful, especially if it is Asian or Indian. With the 2005 Sineann Resonance Vineyards bottle we had a wonderful salmon fillet coated with crushed wasabi peas and lime zest. Served with stir-fried cabbage and snap peas, and accompanied by a mound of steamed jasmine rice, these foods complemented the fruity, spicy wine. Add some spice to your life. Try a gewurztraminer. Gabriella and Ryan have announced the June theme for Catavino's Virtual Wine Tasting. This month, they'd like us to taste a wine from the Bierzo region of Spain. Check out Gabriella's full instructions by clicking here. The DO Bierzo produces wines made from both white and red grapes, including Mencia, Garnacha Tintorera (aka Alicante Bouschet), Godello, Dona Blanco, Malvasia, and Palomino. I'm pretty sure the only varietal on this list I HAVE had is Malvasia, so for a varietal nut like me this is going to be a fun month! This is a fun, relaxed, and informal "virtual tasting," that's great for procrastinators and vacationers since there's no "due date." You don't even need a blog. Just drink a wine from the Bierzo sometime in the next 28 days, post your reactions to it on your own blog or in the special forum, and make sure to check back there frequently for updates and reviews. Richard from Passionate Foodie (a relatively new wine blog that is well worth checking out) has already posted a review of an affordable Mencia wine, so we're off to a great start. If you are looking for Bierzo wines in LA, they can be found at K & L wines, the Wine House, and Mission Wines. If you're a local merchant and you have Bierzo wines and I missed you, leave a comment below so we know where we can shop. So I decided to check out a new wine store right from the comfort of my armchair: domaine547. This is a new, LA-based retail outlet linked to an online wine community that includes a blog, a wine club, and a forum. I love their philosophy: that learning about wine is a journey, that wine should be part of everyday life, that wine lets you travel the globe when your bank account and work schedule won't let you, and that wine is not about snobbery. That pretty much sums up my philosophy, too, so it's not surprising I am drawn to their store and to their wine selection. And what an impressive selection it is. Domaine547 may be a small operation, which means that they can't stock everything that's in the big chains. But who cares when they manage to stock what has become my Holy Grail of wine: Francois Chidaine. Brooklynguy, who knows a lot about Loire wines, puts Chidaine in his top two Loire producers but I never see it on the shelves. Score one for domaine547! Their decision to stock Francois Chidaine was a hint of the good stuff waiting inside the online store--really interesting wine that was not the same old bottles you see everywhere else. In no time at all during my virtual walk down the aisles I filled my shopping cart with a half case of intriguing and affordable wine. I snapped up a 2006 SoloRosa Piccolo Rosso Pinot Noir ($17.99) from the Russian River Valley, a wine aged in stainless steel that sounds truly unique and was recommended to me by the folks at domaine547 as a good summer red in a comment here at GWU$20. I also got a nice selection of white wines, including an Alsatian gewurztraminer from Michel Fonne ($17.99), the longed-for Francois Chidaine from 2005 vintage and the Clos du Breuil vineyard ($20.99), and an Italian white blend (the 2005 Teruzzi & Puthod Terre di Tufi, $16.99). For fun I also selected a 2005 Gaujal Picpoul de Pinet ($9.99) which I know nothing about, but John at Brim to the Dregs likes his Picpoul, so I wanted to try one. The other red I picked (a primitivo) was sold out, and like all good merchants domaine547 shot me back an email explaining the wine had just gone out of stock and giving me a variety of options including holding my order, shipping two orders, or replacing the wine with another wine of similar style and price. I picked the latter, and they sent me a Rosa del Golfo Primitivo that will be perfect with some pizza this summer. All the wine arrived in perfect condition, with some snazzy domaine547 coasters, and because they are in LA the shipping only took one day so there were no worries on my end about the wine getting damaged. Domaine547 has a special section of their online store dedicated to wines under $20, and they've got the 2006 vintage of one of my favorite wines from the past year, Kris Curran's Grenache Blanc. Most LA area shoppers can take advantage of their current offer of free shipping to most zipcodes around the city (even some in the burbs, like mine) by entering the code "FreeLA" in the coupon box during checkout. I'm not sure when or if this offer will expire, so you might want to jump on it now. And if you live elsewhere in the US, they ship to you, too, as long as you live in a state that permits it--it's just not free! 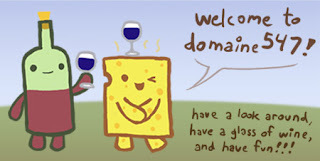 If you are on the lookout for a new club, I'd consider domaine547's wine club. They have a good eye for wine, and you will not get boring stuff, or stuff that's overpriced. Their first club shipment focused on Napa Valley wines, and contained the 2005 Orin Swift "The Prisoner," the 2004 Seventy Five Wine Company Cabernet Sauvignon Amber Knolls, and the yummy 2005 Vinum PETS Petite Sirah. Club shipments are $75, and are accompanied by a great 3-page newsletter that talks about the varietals and where the wine is made, gives tasting notes, and has pairing suggestions and recipes. Next club shipment will focus on Burgundy and the pinot noir grape. I know I'll be shopping at domaine547 in the future, because I love the convenience, the selection, the competitive pricing, and the great attitude they have about wine. Sometimes armchair wine shopping is just the thing when you want to give yourself a treat, but can't leave your desk. Stop by their store during your coffee break this morning and see what you think!